Just like any other Ferrari in the early 2000's, the F2002 proved to be a true masterpiece where no other team was really able to give an answer to. 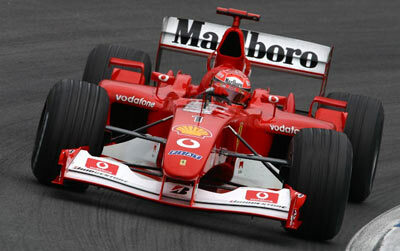 The car was introduced at the Brazilian GP of 2002 and driven by Michael Schumacher. As there was only one available, team mate Rubens Barrichello had to wait until the GP of San Marino to get to race the F2002. Ferrari continued to race the car for 4 races in 2003 before its successor, the Ferrari F2003-GA was introduced at the 2003 Spanish GP. The new Ferrari was launched on 6 Februari, at 11am, in the 'Nuova Meccanica' pavillion at Ferrari HQ in Maranello. It was the start of an extremely successful season for the Scuderia, with a car that would eventually improve on the McLaren MP4-4 as the most dominating car (Senna and Prost gathered 199 points together and won 15 out of 16 races in a single season). Pre season testing revealed the enormous potential of the new F2002, breaking the Maranello track record by more than a second at its first attempt. Nonetheless, the new car would not be used in the first couple of Grand Prix, due to possible reliability problems. 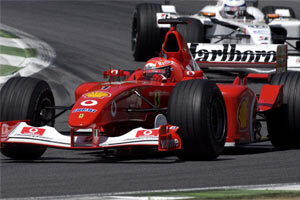 The Ferrari F2001 had proven to be a worthy championship winner, and counting on the experience with the car, the new F2002 did not appear until the Brazilian Grand Prix. Michael Schumacher's team mate however had to wait one race longer, as Ferrari only had a single F2002 at their disposal in Brazil. One of the key aims during the design of the F2002 was a dramatic weight increase and the lowering of the centre of gravity, targeting more freedom for the race engineers to move ballast around to improve the ballast of the car. The chassis was completely new, both in terms of shape, which is a result of the car's aerodynamic development programme, and in terms of construction which has resulted in a considerable weight saving. The suspension and steering system also underwent a major revision. Rory Byrne said at the launch: "There is a fundamentally new power steering system to comply with the new 2002 regulations forbidding the use of electronically controlled power steering. Again, a prototype version has been successfully tested on the F2001. Both front and rear suspension have been revised to maximise the performance of the Bridgestone tyres. The inboard end of the rear suspension has been completely revised to optimise the rear end aerodynamics. Almost all of the suspension components have been refined and many have been manufactured using new materials and manufacturing methods in order to reduce weight. " The car's uprights were also entirely new. 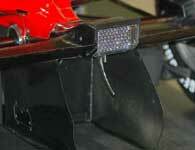 The team introduced new front and rear uprights cast in metal matrix (carbon fibre and aluminium). They are 900g each as opposed to 1.1kg for the cast titanium uprights used on the F2001. This improvement came at certain cost though, as the new version was approximately double the price and more complex to manufacture. On the drivetrain side, Ferrari designed the typo 051 engine, delivering more power and higher maximum revs. The package was revised which the crankshaft was lowered, resulting in an overall weight and dimension reduction. Paolo Martinelli: "There were three main technical principles applied to the design of the 051 engine. Firstly, we ensured we maintained all the strong points of its 2001 predecessor, the 050. Secondly, in order to ensure the necessary step forward for this year, we did however revise all the main engine components. The architecture of the 050 proved successful and was thus retained. The block was made using the latest refined micro-casting technology. The cylinder heads were optimised to increase the fluid-dynamic efficiency of the porting. The crankshaft and its associated components were redesigned, especially with a view to reducing the rotating masses and friction." But perhaps the most important change was Ferrari's entirely new gearbox. It was a completely new assembly, both in terms of the materials used for the casing and the major internal parts as well as the gear selection mechanism itself. The new casing was made considerably smaller, more stiff and made from lightweight titanium alloy, following the example set by Minardi. Along with the lighter internals and the new clutchless direct shift technology, this resulted in a smoother and faster gearshift. Thanks to running prototypes of the gearbox on the dyno as early as September 2001, the team made sure that despite all its innovation, it was reliable from the word go. Ferrari continued to innovate as later in the season, an all titanium block was made to include the differential, gearbox and engine into one solid block by removing the heavy bell housings. There were also plans to use the electro-hydraulic differential instead to be used in performing the functions of a clutch. With such a system, the car would be able to accelerate much faster at higher revs when the clutch had been removed. Without the strain and mass from the rotating parts within the clutches, the engine would evolve nearly a second faster. 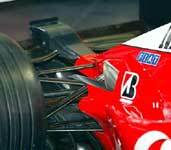 The most talked about were certainly the extremely low sidepods that were unique for the cars in the 2002 championship. To achieve this without compromising the narrow coke bottle shape the radiators were mounted differently. The usually vertically placed oil and water radiators are positioned to lean forward to the upper and outermost part. This allows for the upper side to be several centimeters lower while enabling the aerodynamicists to design a more aggressive downward slope of the upper surface of the sidepods. The angle from the radiators seen from the top of the car are to tighten the coke bottle shape and increase airflow onto the diffuser and rear wing. 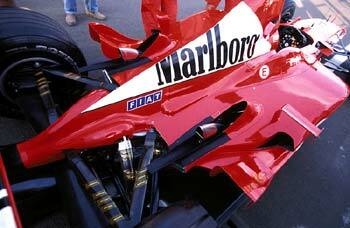 Secondly, the engine exhausts have also changed considerably since the F2001. That car came with high exhausts, blowing the engine's exhaust gases out from the top of the sidepods, instead of blowing through the central part of the diffuser. 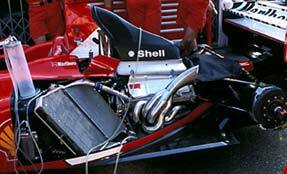 The F2002 changed that part of exhaust history again, now pushing air out a little further away from the rear wing, but more importantly, backwards, and not upwards like in 2001. The exhaust pipe is covered with bodywork that also functions as an air exit. The fact that these two are put together also enabled for more efficient cooling in the sidepods. The fast flowing exhaust gases and the local low pressure area behind the exhaust cover help extract the hot cooling air out of the sidepods. Because of the extremely low sloping side pods, a lot more clean air can flow directly over the sidepods towards the rear wing, making it considerably more efficient. This increased performance, along with the narrower coke bottle shape gives the car unprecedented aerodynamic efficiency. That the suspension arms have hereby come into the main airflow, is no real objection, as the resistance of these aerodynamically shaped arms is of no importance relative to the advantages of the sidepod design. The front wing of the car hasn't changed a lot, neither compared to the F2001, neither during the season's development. It is a two part wing, where the F2001's consisted of three flaps. Some small corners have been cut out at the end of the wing, and at the underside of the wing are strikes guiding air towards the brake ducts. The tip of the nose is slightly higher than with the F2001, while the upper side of the front bulkhead was lowered thanks to compacting the front suspension. Where the F2001 featured an upward slope from the cockpit to the front bulkhead, the F2002 has a gradually downward slope until the tip of the nose. The aerodynamic efficiency in the cockpit area was also greatly improved, especially thanks to the thin 'collar' at both sides of the driver's helmet. Ferrari also opened up the space between the collar and the roll hoop so that air can flow by aside the cockpit's helmet, without having to undergo many direction changes that would cause drag. Looking at the driver's helmet from aside, it is obvious that both Schumacher and Barrichello are quite deep in the cockpit with the head support seamlessly following the shape of the helmet. This enables a good airflow towards the air inlet above the helmet, and limits turbulence to a minimum. The importance of this can be illustrated by Nigel Mansell, who had his seat removed in the late 80's to sit a few centimeters lower to the ground, resulting in 25kg of additional downforce, without any other changes, and even not considering the lowered center of gravity. In essence this was by far the best Ferrari ever designed. In the 15 races it was fielded during 2002, the car won 14, 10 times in second place and another third place finish. The only race that was not won that year was the Grand Prix of Monaco, where Schumacher finished second to David Coulthard's McLaren.